Marble kitchen Worktops should always be designed by professionals and experts with more than a few years in the trade. When looking for affordable luxury, you should never feel that you have to skimp on the best in quality when it comes to marble kitchen worktops and white marble effect kitchen worktops. Our design and fitting experts will line you up with reliable marble kitchen worktops prices and will keep you and your needs at the very heart of each and every step of your home redesign and refurbishment project. We offer Italian marble kitchen worktops, black marble kitchen countertops and more besides. While we may have expertise and experience in quartz and a whole range of different stone suppliers and brands (including Arenastone, Samsung and Istone). we can help to install a fabulous luxury marble bathroom, marble kitchen or even a marble office for you. Stone worktops of this high calibre really are worth the money and the time and effort it takes in getting them in place for you. Kitchen worktops in white or black marble offer unlimited shine and years of use – and with Quartz Care backing you up. You can always call on us to make sure your replacement kitchen worktops – in marble or otherwise – are kept looking wonderful for the years to come. Budget kitchen worktops can come in all shapes and sizes – and different varieties – and while natural marble kitchen worktops UK families and homes opt for look spectacular. This doesn’t mean the cost or prices will be above your budget. We are a bespoke granite and marble countertops supplier based in South East London – supplying white marble effect kitchen worktops and custom marble kitchen surfaces to homes in Lambeth and beyond. Our fabulous black marble kitchen countertops designs are amongst our biggest sellers. Our bespoke services and specialist care allow us to ensure that you buy affordable kitchen worktops in a range of colours and finishes now and pay later. Work with us on a wide variety of designs and ideas and we will bring them to life for you – no questions asked. Pure Quartz are a leading supplier of luxury stone products across the South of the UK. From marble bathrooms, offices and – of course – kitchens – to flooring and more besides, we will work with you to find that perfect, effortlessly classic look. 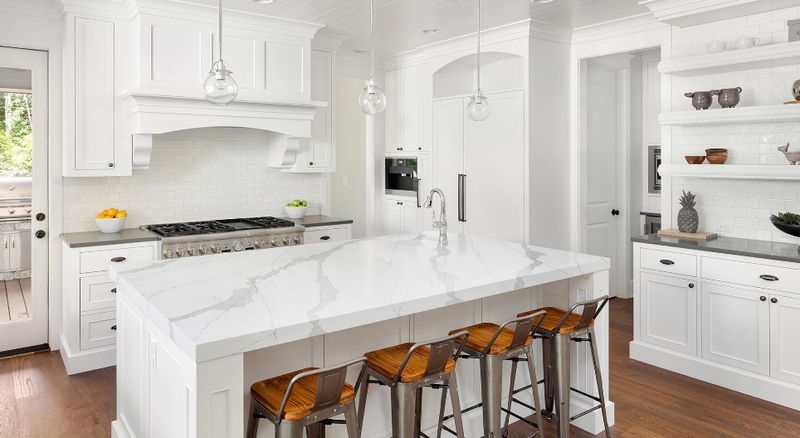 Call Pure Quartz today for a reliable quote – based entirely upon your needs and specifications – and our team will focus on installing the best quality natural stone countertops and worktops for your kitchen and beyond. Call us today on 01233 733111 or email us for further details – and do book in with us for a free consultation and quote. Marble kitchen worktops simply look the part no matter what contemporary or classic look you may be aiming for – let us take a closer look at your existing décor and find a fitting angle.